According to Human Rights Watch, the average speed of dead poultry moving past the inspectors in a slaughtering plant is 70 per minute. That means in the time it took you to read this last sentence you would have been expected to examine six birds for the nearly 20 listed items the Food Safety and Inspection Service list in their 2009 directive. Whether it be “pulling the cut skin and muscle back [to look for a] … yellow scabbed areas between the skin and subcutaneous tissue…enlarged or reddened kidneys that indicate infection of early sepsis, [or] …an overscalded carcass.” One second per bird is optimistic at best. This fact, along with many others about the state of our slaughtering facilities in this country, is why I wanted to kill my own chicken. 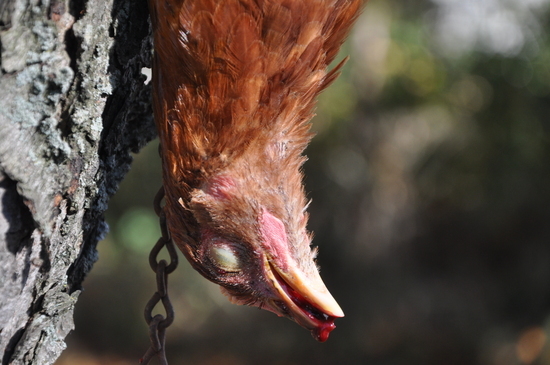 John Harnois, of Harnois Farms, was kind enough to teach us one fine October day — he set up his metal funnel to hang the bird, a tub of water to scald the feathers and a de-plucking machine for after the deed was complete. Many people I have spoken to about killing birds dispense with the first part of the process, but Harnois explained he felt it more humane to render the brain dead before draining the body of blood. After placing the chicken upside-down in the funnel, we grabbed its bottom jaw. Quickly before losing my nerve, I drove the point of a sharp paring knife through the upper soft palate into the chicken’s brain. After watching the eyes slowly close, my husband took a pair of double-handed pruning shears and lopped off the head. While we waited for the body to drain of blood, there was a great deal of movement and activity. The bloody neck emerged once or twice from the headless feathers and the legs scissored back and forth. Watching an animal progress through its death throes is not for the tender hearted. Once the chicken had stopped moving we took it by the legs and dunked it completely in a large vat of simmering water (hot enough to loosen the feathers, but not so hot as to cook the bird). Deemed ready by Harnois when a few feathers came out to his tug, we held the bird over the rapidly spinning rubber fingers of the de-plucking machine for the majority. Once the feathers were off, the chicken no longer felt to me like the same animal that pecked and preened and stretched in our back garden. The chicken, without feathers, became a biology experiment. Cutting around the vent and removing the innards was 100 percent benign in comparison to the emotional bracing it took for me to stab a living chicken through its brain. Yet without the stab, there is no dinner, which is why I stabbed. This entry was posted in On the Farm and tagged Animal Slaughter, Backyard chickens, Chicken Processing, Corinna Borden, Real Time Farms. Bookmark the permalink. Did you purchase, make or rend the “plucking” machine? Corinna, please forgive me. Apparently, I can neither spell nor read. I see that John Harnois brought his equipment. I’ve been fretting over the inevitable first time myself. I have six male guinea fowl and two females– not a great mix. Still finding plenty of excuses to delay, but the day will come eventually…. @Amanda – no worries, I wish you luck with your charges. The plucking machine was very helpful, but we still had to do some of the pin feathers by hand.